The state assembly passed a bill on Monday that would eliminate money bail -- that means no more cash or bonds to get out of jail while awaiting trial. Low level offenders would be released. For serious crimes, judges would use a formula to decide who should be held or released pre-trial. We speak with the bill’s sponsor, California Senator Bob Hertzberg; and the bill’s opponent, the ACLU. The state assembly passed a bill on Monday that would eliminate money bail -- that means no more cash or bonds to get out. Low level offenders would be released. For years, Somali pirates would hunt down and take control of international vessels, and demand ransom for the return of the ship and crew. Madonna at the VMAs: Did she pay tribute to Aretha Franklin or herself? Michael Cohen admitted in court today that he broke campaign finance law “in coordination and at the direction of a candidate for federal office,” referring to Donald Trump. 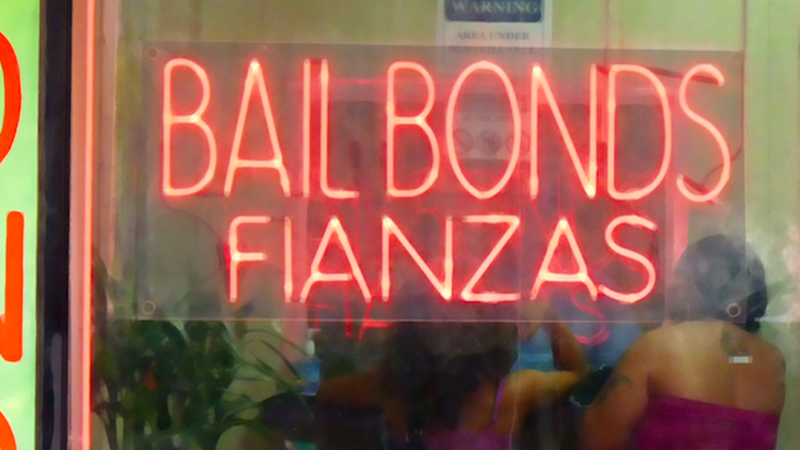 Bail bond image by Lionel Martinez.